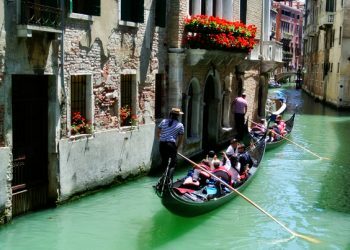 One of my favorite events in Italy is Carnivale, the last celebration before Lent that begins on Ash Wednesday. 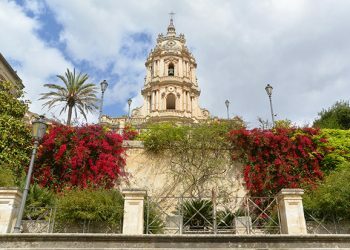 Since Lent has traditionally been a period where Catholics deprive themselves of something they enjoy, Carnivale is a time to party and to indulge in the fried, or rich foods that will be given up for Lent. 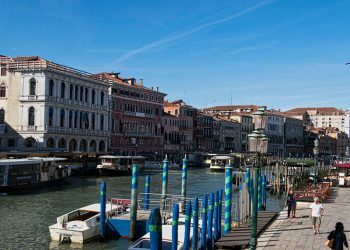 In Italy, Carnivale is celebrated in both the big cities and small towns from Milan all the way down to Sicily, although Venice and Viareggio have become the two most famous spots to experience this celebration with grand parades, elaborate costumes, and rich foods. This year Shrove Tuesday (also known as Fat Tuesday) takes place on February 9th. 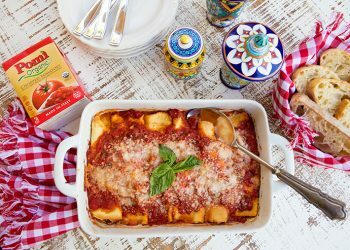 To celebrate this year’s Carnivale, I decided to make sausage stuffed potato gnocchi with a luscious, fresh-flavored tomato sauce. The filling is made with sautéed sausage and onions that are lightly bound together with some grated cheese and an egg yolk. 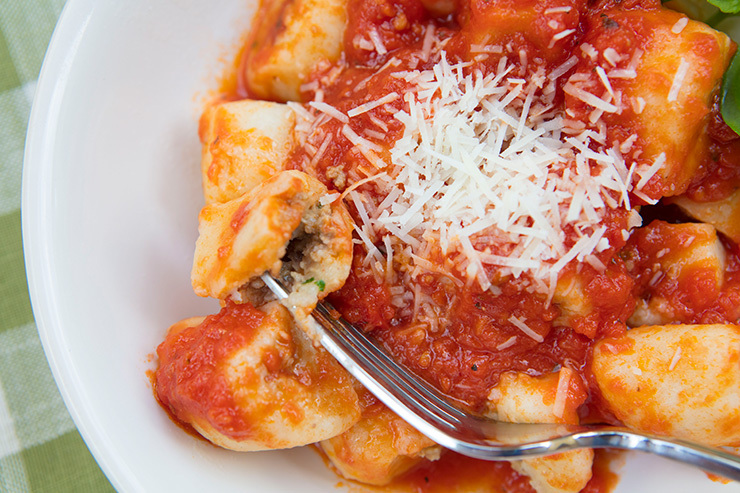 Since this gnocchi is so hearty, I decided to top it with a simple, light flavored sauce to allow the filling to shine. 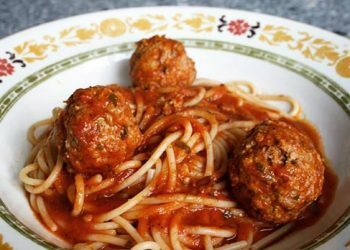 This easy sauce was made famous by the late Marcella Hazan and combines crushed tomatoes, onion, and butter, an example of simple Italian food at its best! 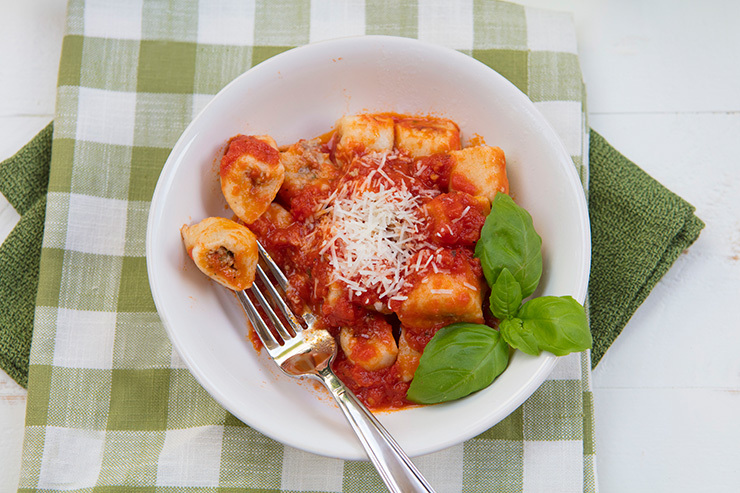 Making memorable potato gnocchi is quite easy if you follow a few simple steps and choose the right ingredients. 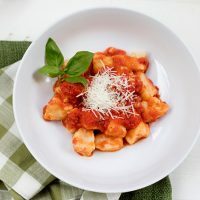 Since the two primary ingredients include basic all-purpose flour and potatoes, choosing the right potato is possibly the most important task when making this type of gnocchi. 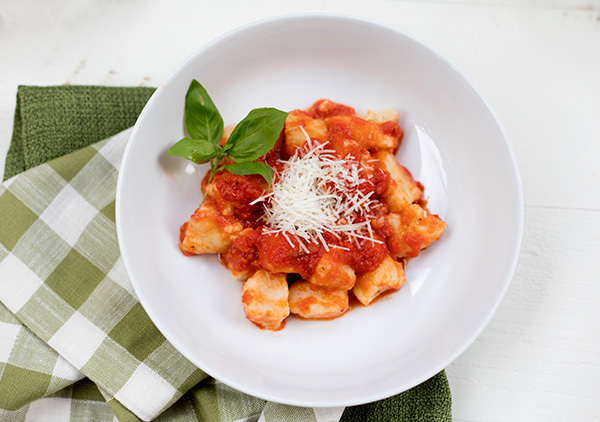 You need a good starchy potato for gnocchi, and Russet potatoes (also known as baking or Idaho potatoes) are ideal. These potatoes have a floury, dry texture; that fluff nicely when baked, and along with making great gnocchi, they also are perfect for frying, baking or mashing. Yukon Gold potatoes considered a medium starch potato, are also good gnocchi potatoes, but I prefer the Russet variety. When buying starchy potatoes such as the Russet variety, choose ones without blemishes, wrinkles, or cracks. Although potatoes are often sold in bags, I prefer to choose my potatoes by hand, so I can pick ones that are firm and dry. If you do buy your potatoes in a bag, pick ones sold in perforated bags so that air can circulate. Potatoes will keep well for up to two weeks in a cool, well-ventilated place, preferably between 45 to 50 degrees F. Avoid storing your potatoes in areas that reach high temperatures, such as beneath the sink or next to the dishwasher, or in areas that receive too much sunlight. 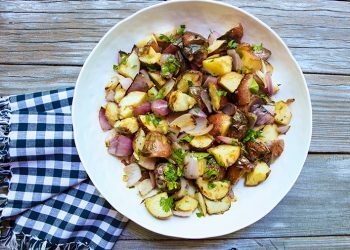 It may surprise many people who think of potatoes as simply a filler or side dish that this popular vegetable is packed with nutritional value. Potatoes are high in potassium, and in fact, contain more than bananas! One medium potato also contains 3 grams of protein, 2 grams of fiber, vitamin C, and an assortment of antioxidant phytochemicals. Potatoes are also a good source of vitamin B6 as well as iron. No wonder potatoes are the number one vegetable crop grown in the world! Now that you have chosen the best potato for your gnocchi, all you need is all-purpose flour, a little salt, and a couple of egg yolks. (we’ll discuss the filling later) You can find many recipes that will call for tipo “oo” flour (also called pizza flour) or a combination of all-purpose and tipo “oo” but after a lot of testing, I find all-purpose flour works just fine. There are also many folks that prefer to make eggless gnocchi because they feel the eggs bind the gnocchi and can make it too dense in texture, but my gnocchi has always been very light, and I always use egg yolks. To enhance the dry, fluffy texture of the Russet potatoes, I always bake, not boil my potatoes when using them for gnocchi. To keep the potatoes as light and fluffy as possible after baking, a potato ricer, not a potato masher is the tool of choice. The ratio of flour to potatoes may vary, but is approximately three-quarter to one cup of flour to every pound of riced, baked potatoes. This post was sponsored by the United States Potato Board (USPB), which is the nation’s potato marketing and research organization. 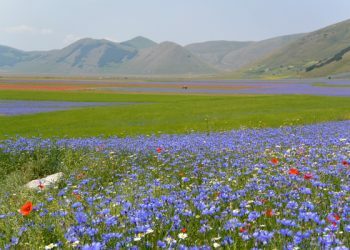 Based in Denver, Colorado, this organization represents more than 2,500 potato growers and handlers across the country. 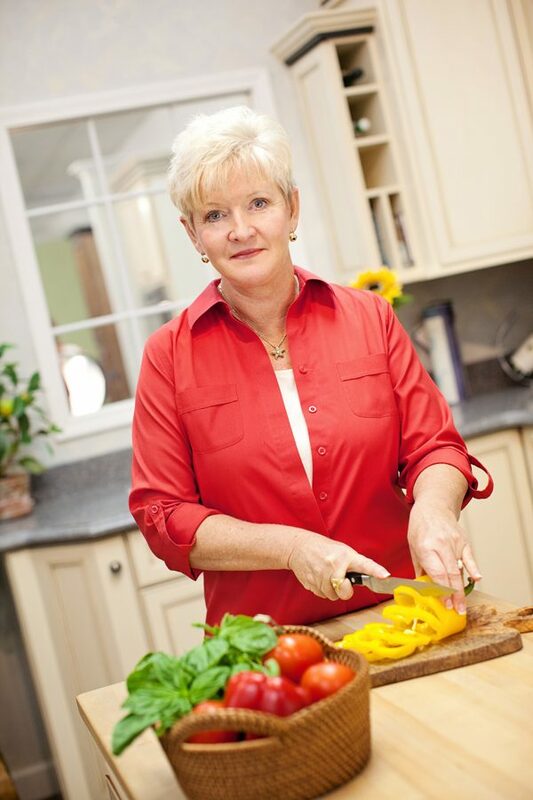 Founded in 1971 by a group of potato growers, they are known today as the largest vegetable commodity board, and an innovator in the produce industry. The USPB website is packed full of information about potatoes and well worth checking out. Bake the potatoes (skin on) in a preheated 375 degrees F. oven until fork tender. While the potatoes are baking, make the sausage filling. Heat the oil in a frying pan over medium heat, and then break up the sausage meat into the pan. Cook until no longer pink, using two forks to break up the meat as it cooks. Add the onion and garlic, often stirring, until the onions are translucent, about 5 minutes. Add the red wine and cook until the wine has evaporated. Place the sausage mixture along with the salt, pepper, egg yolk, and cheese, into a food processor, and pulse until blended. 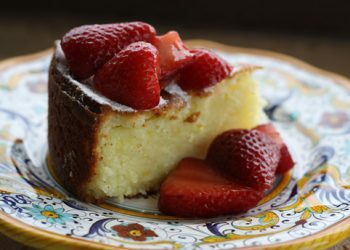 Dump the mixture into a small bowl and refrigerate until needed. 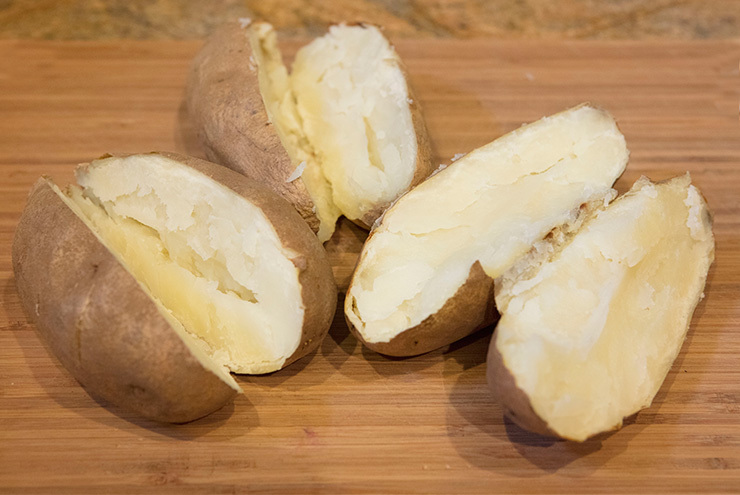 Once the potatoes have baked, cut the potatoes in half and allow to cool for 5 minutes. 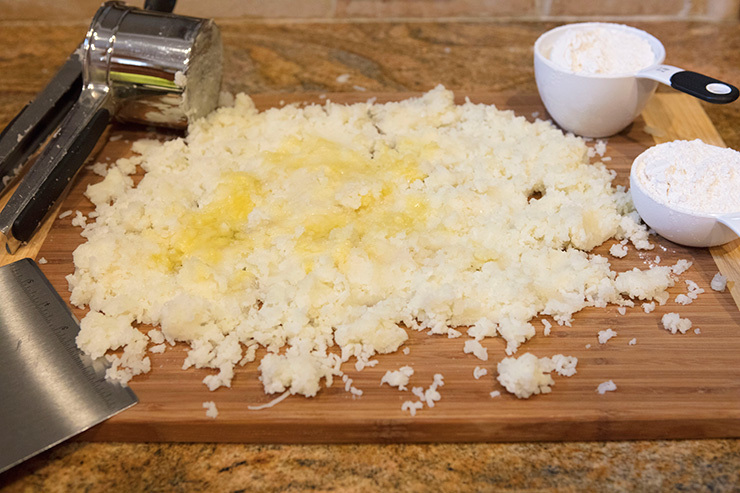 Scoop the flesh from the potatoes, and press through a potato ricer onto a clean counter or bread board. Spread the potatoes and allow to cool just until warm to the touch. Beat the egg yolks and pour over the riced potatoes. Sprinkle 1 cup of the flour and salt over the potatoes and use your fingers or a pastry scraper to work the flour gently into the potatoes. 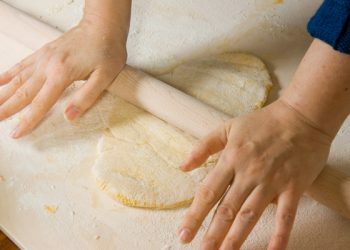 Use your fingers to gently knead to dough adding the additional 1/2 cup of flour as needed until the dough just comes together and is no longer sticky. Shape the dough into a log. Divide the dough into three pieces, and roll one piece into a log about 2 inches in diameter. 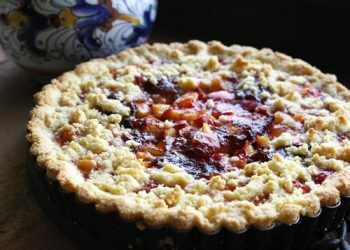 Use your fingers to create an indentation down the center of the dough, being careful to leave some dough at the bottom, creating a canoe shape. 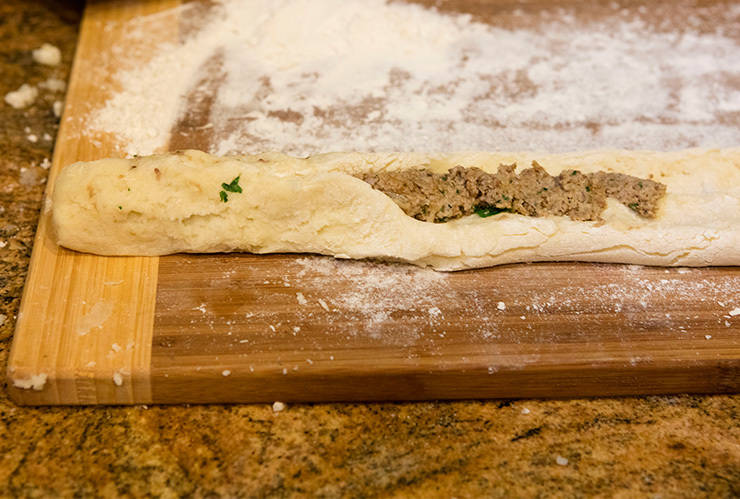 Spoon the sausage filling into the indentation, and then bring up each side of the dough to cover. Use a little flour and roll the log until it is about 1 to 1 1/2 inches thick being careful to keep the filling encased in the dough. Use a sharp knife, and cut the log into 1-inch thick slices, placing the cut gnocchi onto a lightly floured baking sheet. Continue to fill and shape the remaining gnocchi dough. Refrigerate gnocchi until needed, but no longer than 8 hours. 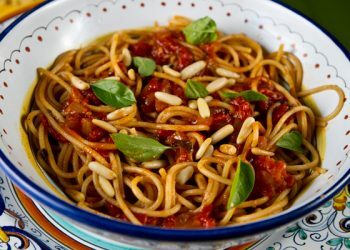 To make the sauce, place the tomatoes, onion, and butter into a saucepan and bring to a boil. Reduce the heat to a simmer, and cook for 45 minutes. Remove the onion, and season the sauce with salt. 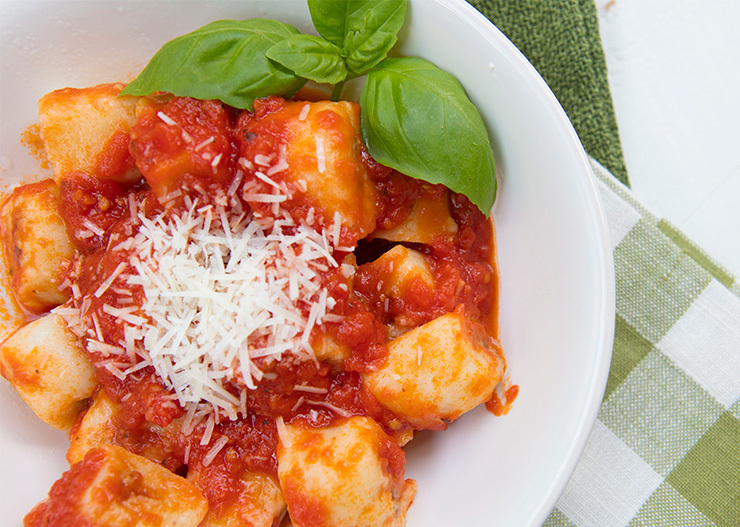 Cook the gnocchi right from the refrigerator until they float to the surface. Drain the gnocchi, and then return to the pot. Add half the sauce, and gently stir to coat. 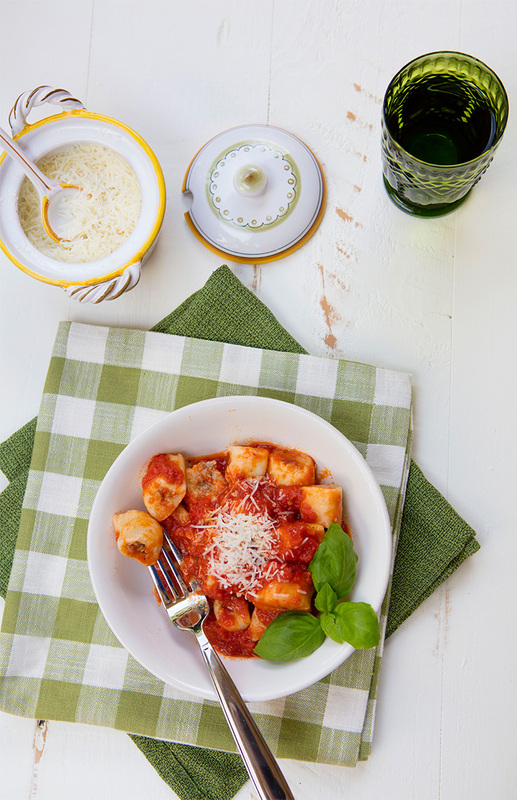 Serve the gnocchi in individual bowls topped with an extra scoop of sauce.